Here is the first page of Mission 009! I wanted it to be clear that this issue, more than any other before it, is a V-Scope focused issue. As I do more and more issues, I’m really looking forward to focusing on different members of the team while still having the team very much still there. When I decided to do an issue about fast food, I knew V-Scope would be the perfect vessel for those like me that still love fast food and kid’s toys. I hope everyone can relate to V-Scope’s enthusiasm over learning about a new food item or toy to collect. 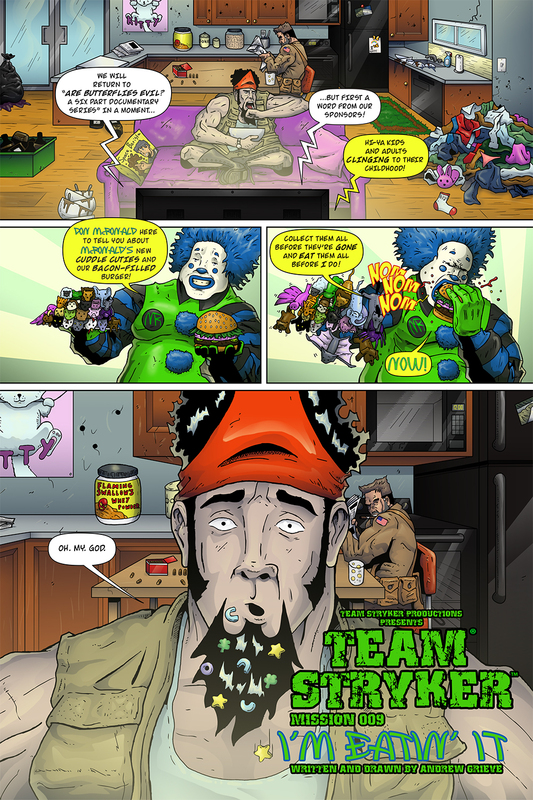 This is also the first issue to give you a glimpse into the Team Stryker household. My theory is that 1. They’re guys so it’s not going to be well kept, and 2. They get attacked there every other week and have given up on patching bullet holes. Hopefully in future issues I’ll be able to show more and more of their home and what the downtime life of Team Stryker is like. Team Stryker will be back again next Monday, but in the meantime you can follow Team Stryker on Facebook, Twitter and now Patreon!